In this exclusive movie, Pan Yi-Cheng of Produce Workshop explains how his team used fabric-stitching techniques to create the plywood pavilion that was named World Interior of the Year last month. 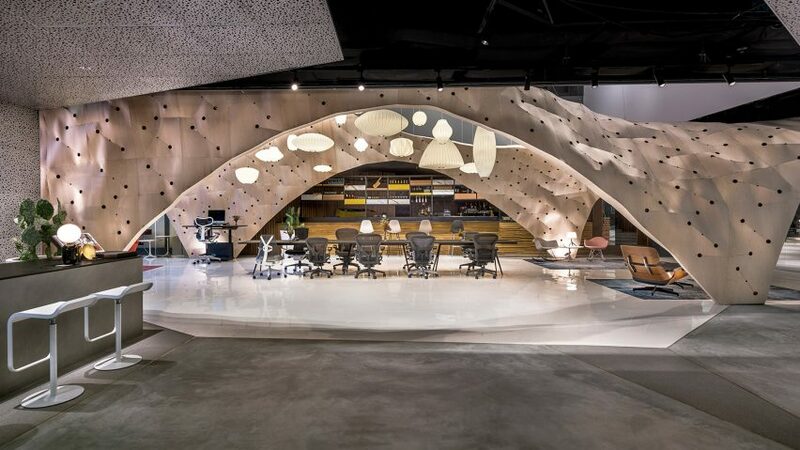 Called Fabricwood, Produce Workshop’s pavilion was installed in a Singapore department store as a display area for office furniture manufacturer Herman Miller. The structure is made from sheets of moulded plywood – a reference to the Eamesfurniture the brand is famous for. Design director Pan Yi-Cheng says that the studio’s main objective was to explore a new construction process, rather than creating a new form. “We looked at designing an experimental process, instead of designing the end project,” he says in the movie, which Dezeen filmed in Berlin for Inside Festival 2017. Pan and his team developed a process of stitching sheets of plywood together to construct the pavilion, creating a three-dimensional form from an otherwise flat surface material. The arches of the pavilion are abstracted versions of the Herman Miller logo. The design references Herman Miller’s different ranges of furniture, Pan says, from the plywood Eames furniture to the brand’s iconic Aeron range of ergonomic office chairs. Pan hopes that the pavilion will encourage visitors to learn more about the Herman Miller brand. “Once the customer gets to know the process and the motivation of why we’re doing it, I think they will learn much more about the brand and that’s actually what we wanted to create,” he concludes. This movie was filmed in Berlin for Inside Festival 2017, an event and awards programme celebrating the best interior design of the year. The festival took place in conjunction with World Architecture Festival 2017 in Berlin. Dezeen is media partner for both events and is publishing a series of videos about the winning projects.